New generation afterglow pigments are available, which are up to 10 times brighter and glow 10 times longer, as compared to conventional photoluminescent pigments. These new types afterglow pigments exhibit excellent light fastness and chemical resistance and are suitable for prolonged outdoor use. They find applications in coatings, inks, paints and polymers. 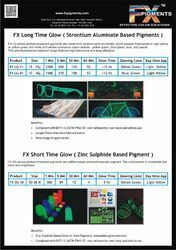 - Classical zinc sulphide based Glow-in-Dark Pigments for use in coatings, inks, paints and polymers. - Quick excitation, suitable for both water and solvent based system, economical. - Compliant with EN71/3, ASTM-F963-07, RoHS, REACH, non-radioactive, non-toxic and safe to use. By utilizing skills of dexterous workforce, we are trade and supplying a comprehensive assortment of Photoluminescent Pigments. - Widely used for ceramic, plastic, paint, and screen printing area. Jash dark glow pigment is produced mainly from the rare earth elements through a special technology, the pigment can glow for up 20 hours after its 10 minute exposure to a visible light source, preferably those with ultra violet rays like sunlight or uv ( black light ). The process of absorbing emitting can be repeated forever. The primary characteristic that differentiates Glow in the Dark pigments from other colored pigments is that the pigment absorbs light energy and then slowly releases it as glow. From colourless to coloured: purple, red, blue, sky blue, green, orange, and yellow. Particle size: 5um-10umKeep sealed in a dark, dry and cool place, away from direct sunlight. Jash Photoluminescent photo printing paper are made of Jash photoluminescent pigment and good quality vinyl material. After absorbing visible light for 10-30 minutes, Jash photoluminescent photo printing paper will glow more than 8-12 hours in the darkness. 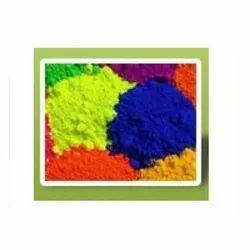 We are engaged in offering excellent quality Photoluminescent Pigment to our valuable clients. By that we achieve excellent brilliancy, fineness of dispersion and fastness properties. Pigment colours are in case of brilliancy of shade and degree of ton on textile fabrics are much better with any binder.